Sasha, Cody & Darwin LIVE! River Oaks Country Club July 4th! 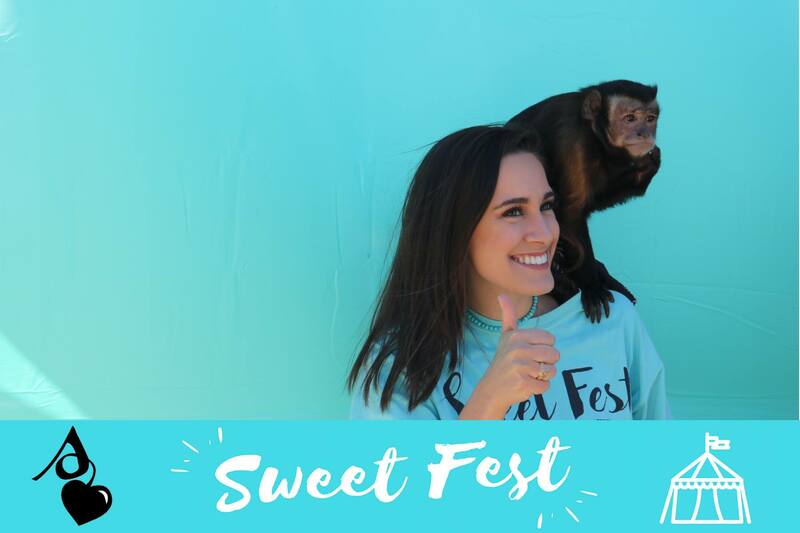 From center stage with comical performances to convention halls marketing your product or service to private family parties, no matter your venue or event theme there is nothing like a little monkey business to make it a memorable success! 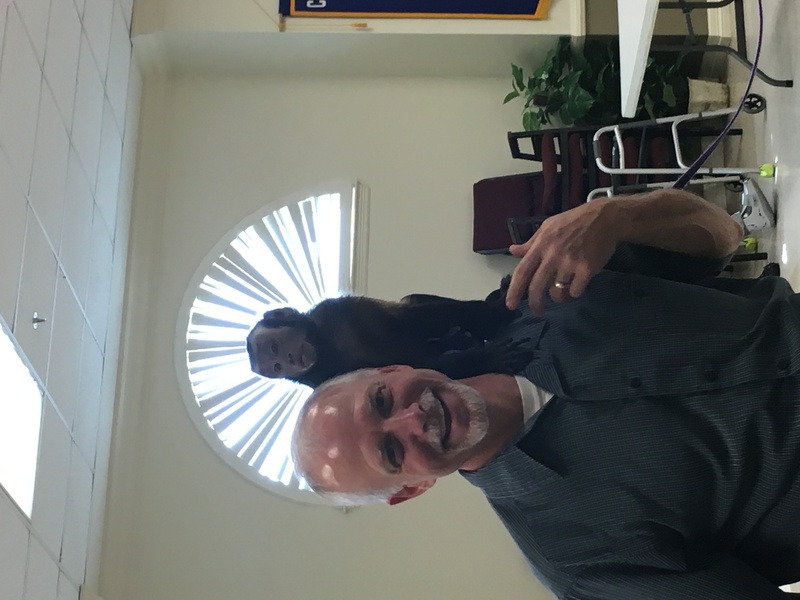 Everyone loves to monkey around, especially when it's with a real monkey or two. 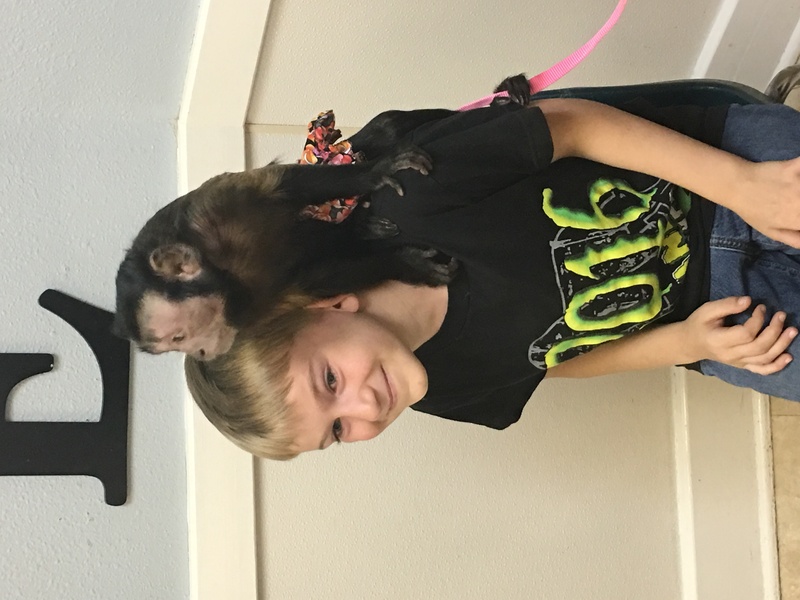 Let Sasha and Cody the two friendliest, most loving Capuchins delight and entertain you and your guest at your next party or event. Each guest gets to interact with them and receive a printed photo as a keepsake! Thank you for including us in your wonderful party. Your decorations were off the top and Clown Mom was the best! It was awesome, the children and their parents was amazed. Absolutely incredible! 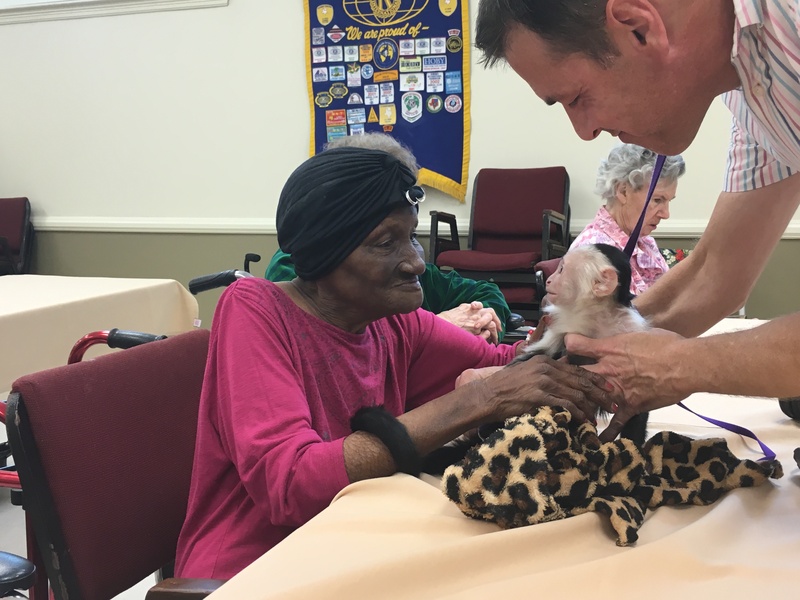 We are so thankful for ms monkey emporium! Working with Robert and Sasha and Cody was absolutely a joy! All of our guest were very impressed and left so happy, one of the best birthday parties ever! Thanks for including us in Aleyna's first party. We had a great time and your decorations were the best! Sasha said thanks for the taco too! 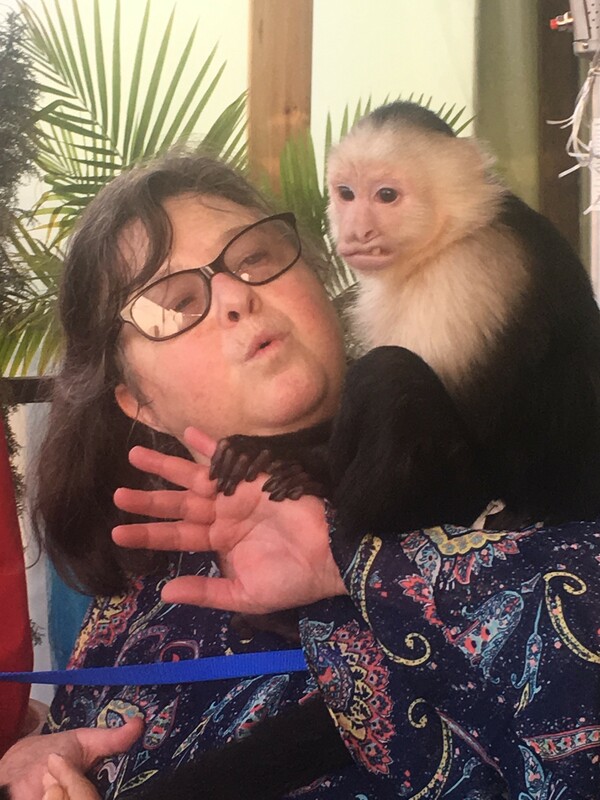 My wife had been wanting to have a monkey experience for a long time, since her family had a Capuchin when she was a child. 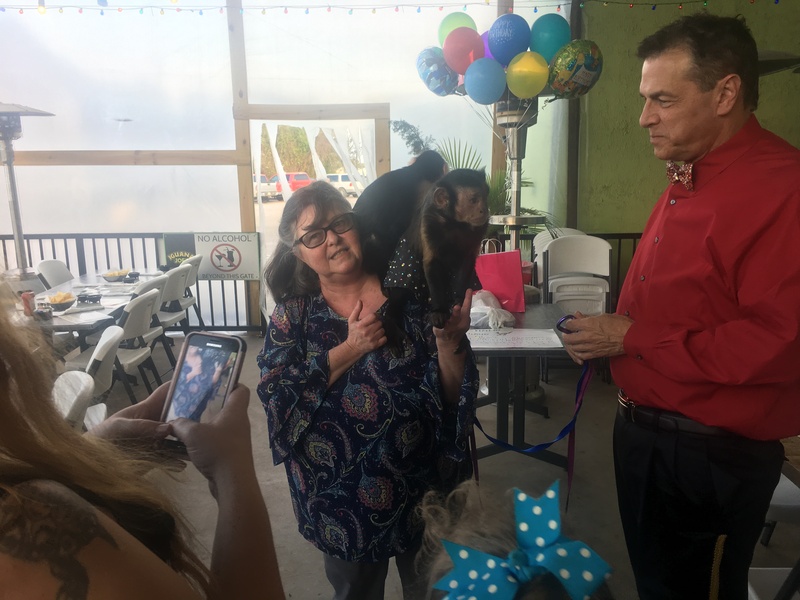 Well, she was ecstatic when I surprised her with Ms. Monkey’s at her surprise birthday party. Sasha & Cody were extremely well behaved & their handlers, Robert & Isaiah, were very nice, friendly, & informative. I highly recommend Ms. Monkey’s Emporium for party entertainment & will not hesitate to use them again if the opportunity arises. Your wife is a wonderful person and we are so glad to have been able to surprise her and be apart of her priceless reaction! Thanks! Had an awesome time meeting Cody and Sasha. I did it as a surprise for my boyfriend, and he was absolutely thrilled! GigSalad was super easy to use for booking. 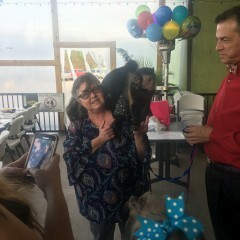 Thank you, Ms.Monkey's, for a truly one of a kind experience!! It was great meeting you, your Mom and your obviously very lucky boyfriend! Thanks for including us! Please follow our Facebook and anytime you can come see us at a public event, Sasha and Cody will remember you! 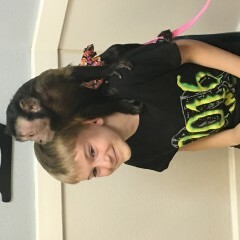 Kids had a great time learning about monkeys and taking pictures with them. Thank you! Thanks for the opportunity! Your scouts were the best! 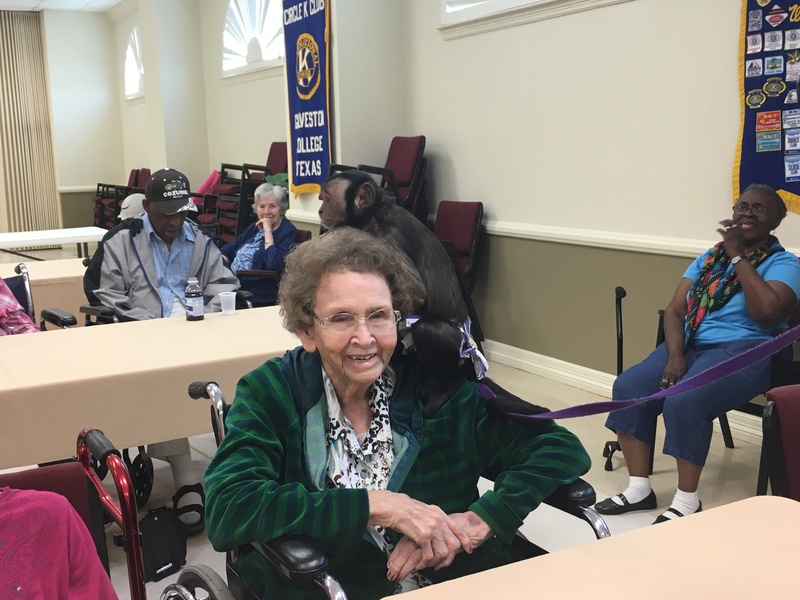 Great interaction, and lots of fun for all. Wonderful experience. Loved the monkeys!! THANKS! We had a great time being included in your party! Your pictures will be posted shortly! 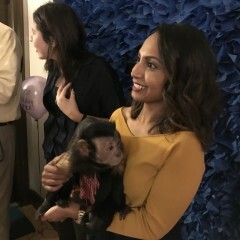 We absolutely loved having Ms. Monkey at my daughter’s birthday party. She is 2 and Obsessed with monkeys. She was amazed. She even got to hold Sasha by herself and she was in love. 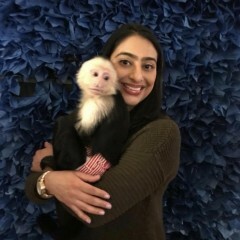 I would definitely recommend Ms. Monkey! Brianna, thanks for including us in your party plans! It was a delight to see how excited your daughter was with seeing Sasha! Definitely recommend them for your next party! 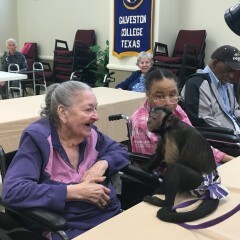 I work at Autumn Leaves Cy-Fair Senior Memory Care and hired Ms. Monkey's for our Safari Family Night. They were a huge hit! The monkeys and trainer :) were very well behaved. The pictures the photographer, Chris, took were wonderful! Can't say enough about Ms. Monkey except we plan on having them back!!!! 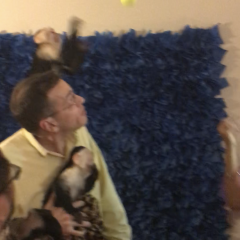 The monkeys were a huge hit for our son’s birthday. Everyone had quality time with them and they were fascinating. My son absolutely loved them and they were so good and sat with him and he hugged on them, tossed a ball with them and fed them treats. Thanks for including us in your wonderful party! Sasha had an amazing time with your son! Funny, super Cute and an Unexpected surprise for the crowd!!! Surpassed our expectations and made our daughter's party!!!! 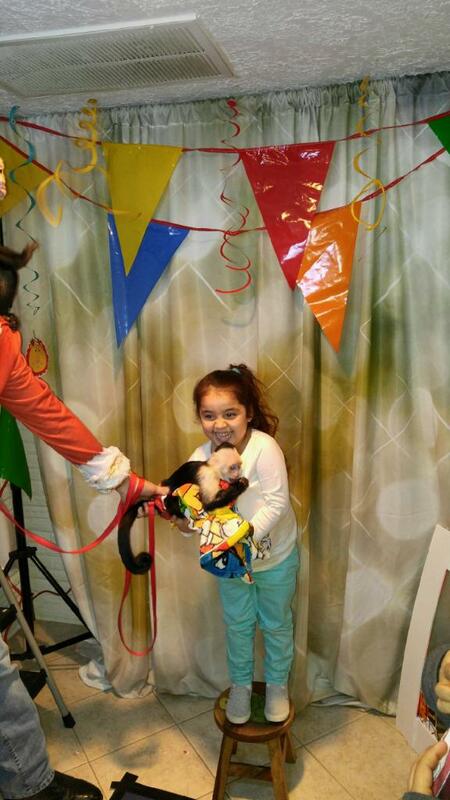 Thanks for including us in your daughter's outstanding party! This was wonderful entertainment for our daughter's birthday party. 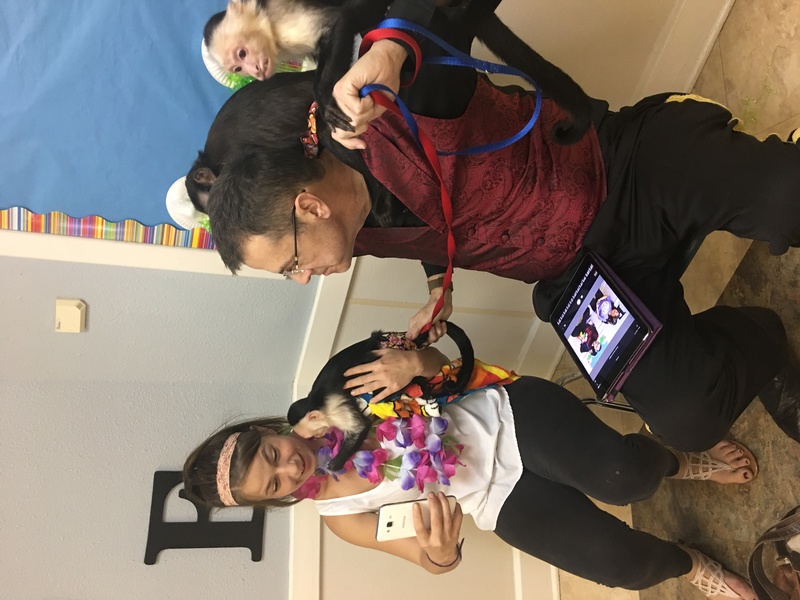 The guests loved the monkeys and the handlers were very helpful and polite and even provided us with some printed photos that I was able to distribute to some guests before they left. I highly recommend them for monkey and animal lovers. 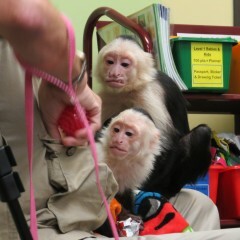 We will be using them again and will ask for the monkeys to show us more tricks next time! They are quite amazing and very sweet. Thanks Ms. Monkey's! Thanks for including us in your party! Look forward to seeing you again. 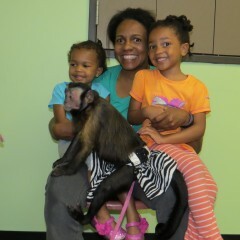 We truly enjoyed the amazing experience we were given with the monkeys this weekend!! 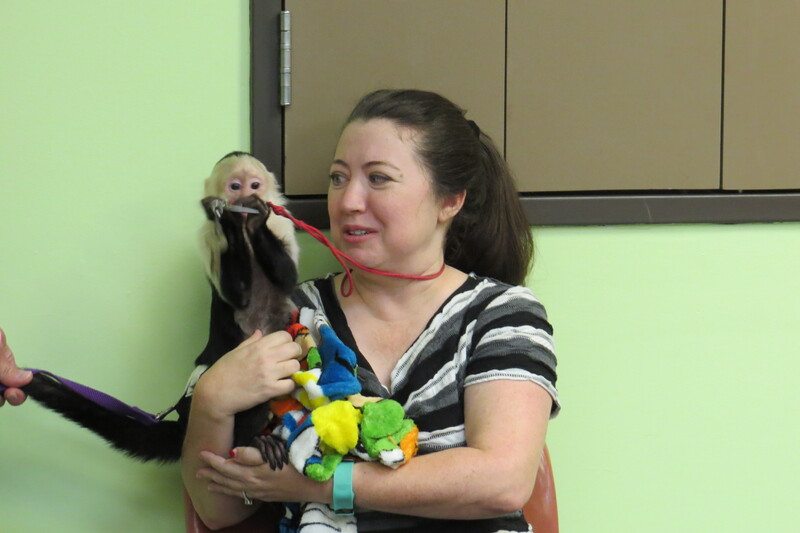 Both entertainers were great and well knowledgeable about the monkeys!! 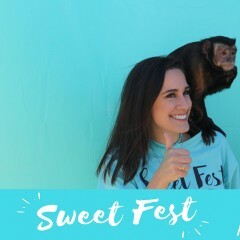 I will defiantly be recommending this company to future monkey lovers!!! Thanks Joy sit was a pleasure to meet you all and to be able to share Sasha, Cody, Darwin and Max with you! The monkeys were so amazing ! Everyone loves them! 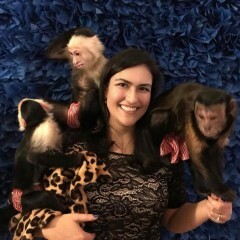 Monkeys are my favorite animal and several times I was supposed to see them in the wild and it always worked out I couldn’t , my husband surprised me and brought the monkeys to me. Me. Monkey really tailored the whole experience to us and went out of their way to make it fun for us. 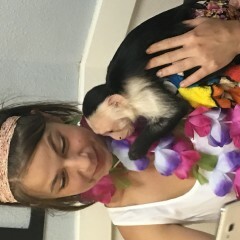 The monkeys are just the sweetest thing. Thanks you and. Monkey! We appreciate you all so much! We had a great time with your wonderful family and friends! Thanks! Here is a link to all of the photos! 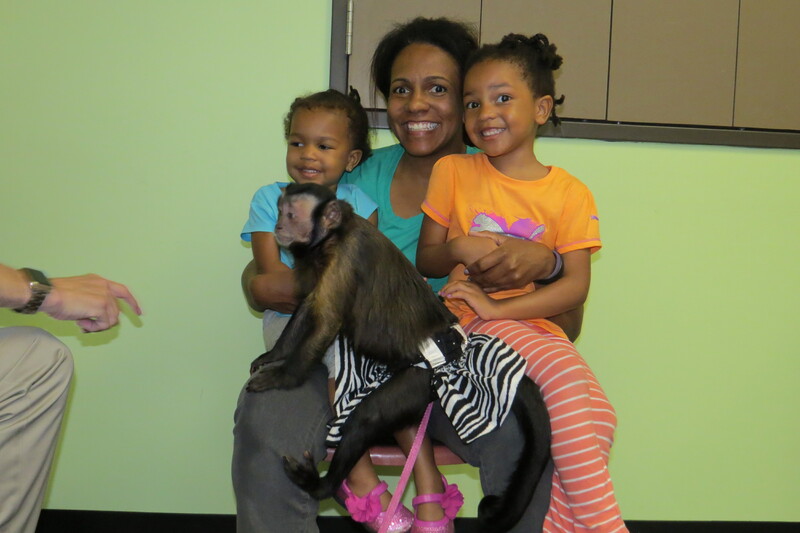 The kids absolutely love the monkeys and so do the adults! Their caretaker, Robert, is very friendly and great with kids! The best part is that they take their picture and print them on site so you can send them home with them as a memento. The children, parents & teachers were extremely pleased with the event. It was one of the best we have had at our center. Thanks for having us! We had a great time and the thank you card your students made means so very much! The animals were great. We had a wonderful time. Everyone was excited to see them. 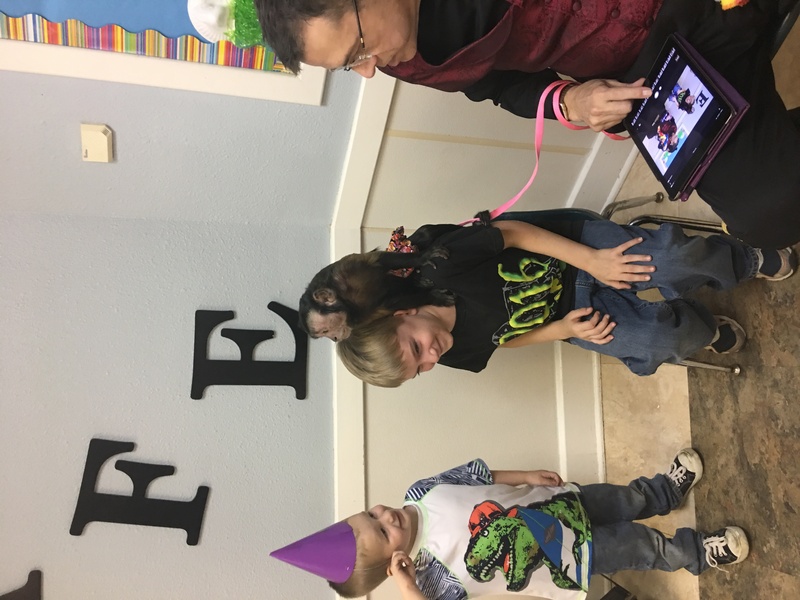 We booked Ms. Monkey's for our annual school fundraiser, which was a carnival this year. 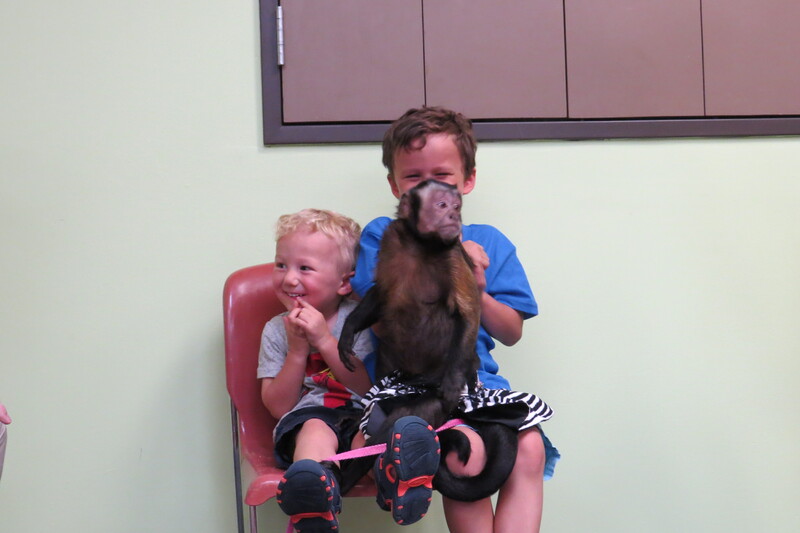 All of our students and their families got a kick out of meeting Sasha, Cody and Darwin. Being able to take home a photo was a great bonus, too. We will definitely consider booking again for future events. Highly recommended! We had a great time celebrating our daughters 2nd birthday with Darwin, Sasha and Cody! Thanks for including us in your daughter's 2nd Birthday Celebration. Here is a link to all the photos! 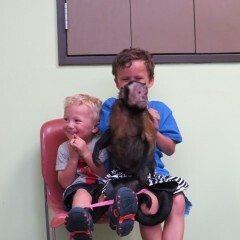 My boys (and all their friends) had an absolute blast interacting with the monkeys. It was such a fun experience for everyone. They arrived on time and were very pleasant to work with. I would highly recommend Ms. Monkey’s to anyone. Thanks for including us! The birthday boy and Sasha had such a great time together! Made our philanthropy fundraiser so fun! Robert was always willing to work with us and was very accommodating as we prepared our first event of this kind! 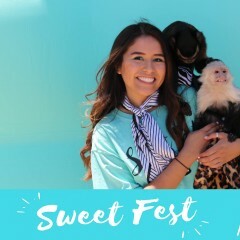 Sasha, Cody, and Darwin were super fun for everyone to interact with that came to our philanthropy event. 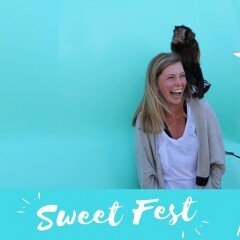 The personalized photo was also a big hit and added to just how personal and sweet the experience was, they even shared a photo album afterwards for everyone to see! 110% would recommend to anyone and everyone! Thank y'all so much! Diana, Thanks for including us in your great event! The party went wonderful! 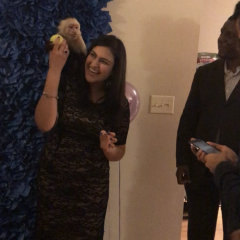 All the guest loved being able to take pictures with the monkey and my daughter still talks about her party! 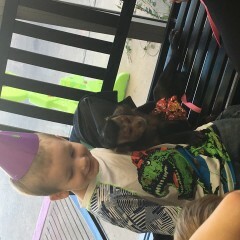 First of all, Ms Monkey was able to accommodate his schedule last minute to be at our boys birthday party. Arrived on time, was professional and very friendly with the crowd. Just wished he could have stayed longer, he couldn’t since he had other commitments. Definitely will keep him in mind and will book in advance. 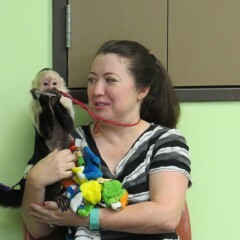 The monkeys were so much fun! Great addition to any event! Emma, Thanks for including us in your tradition! It was a lot of fun. My quote to you clearly stated what we do and that is exactly what we did and as you stated, "everyone loved them." 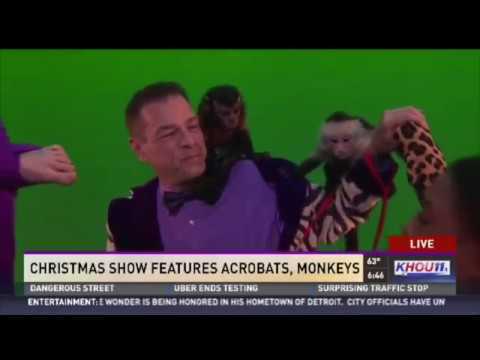 No where in my quote do I state that the monkeys will do tricks. Your review, as you state is based on what you thought, not on the quote you agreed to when you booked us. I go above and beyond to create smiles and lasting memories through interaction with Sasha, Cody & Darwin and the photos we produce. I printed 80 photos for you that you were not expecting, yet that was in the quote too. Ratings and number of stars should be based on how well we performed the quote that you agreed to, and your own words and the smiles in the 278 photos we took and posted prove we did a 5-star job according to the quote. Thank you for including us! We had a great time! What a wonderful experience!! 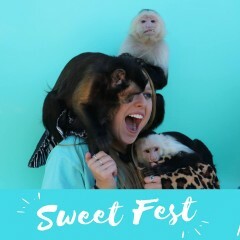 The monkeys were so adorable and entertaining! My daughter was in heaven and enjoyed every minute as did we and our guests! Highly recommend! Everyone enjoyed Sasha, Cody and Darwin so much!!! 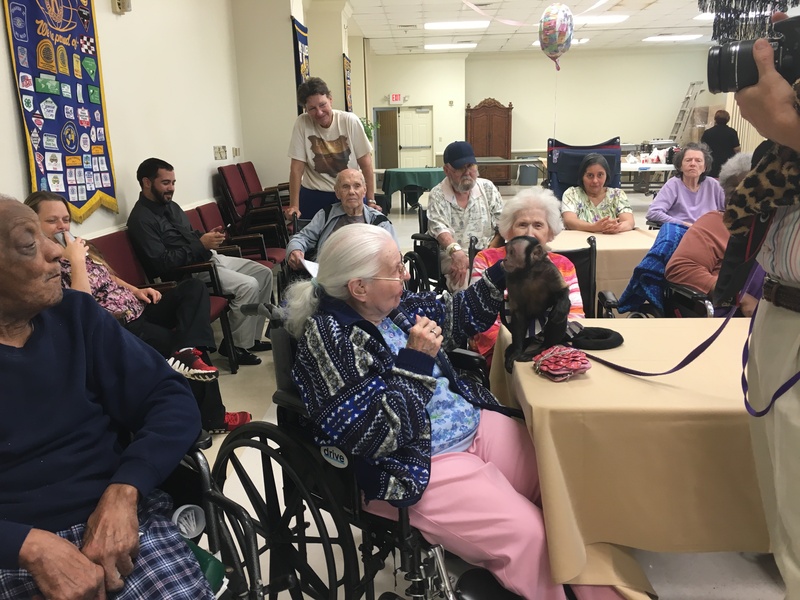 We had a ball of a time getting to know Sasha, Cody, and Darwin! They are friendly and we even played catch. Robert and Lorenzo were on time and professional, providing a great experience for my adult bday party. 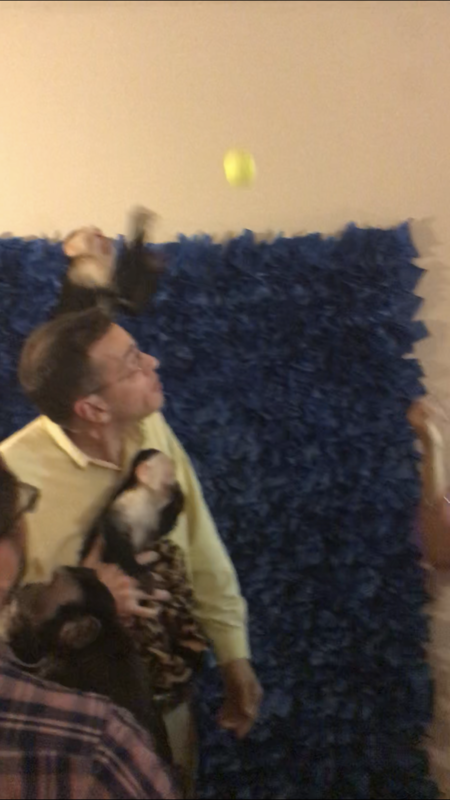 My husband was initially worried about having monkeys at our apartment, but as soon as they arrived he could see they were well behaved, were on leashes, and had diapers. My husband loved meeting them and got a kick out of their interest in our tissue paper decorations! As soon as I get the opportunity with a different group of people, I’d love to hire them again. Thanks Vipra! You and your husband were wonderful hosts and we enjoyed meeting you and bringing smiles to you and your guest we welcome the opportunity to work with you anytime! Sai, Here is what I sent to you as the services we offered. Never does it state we will do a show! You also only wanted 45 minutes and that was barely enough time for everyone to have the opportunity to interact with the monkeys and receive a printed photo. 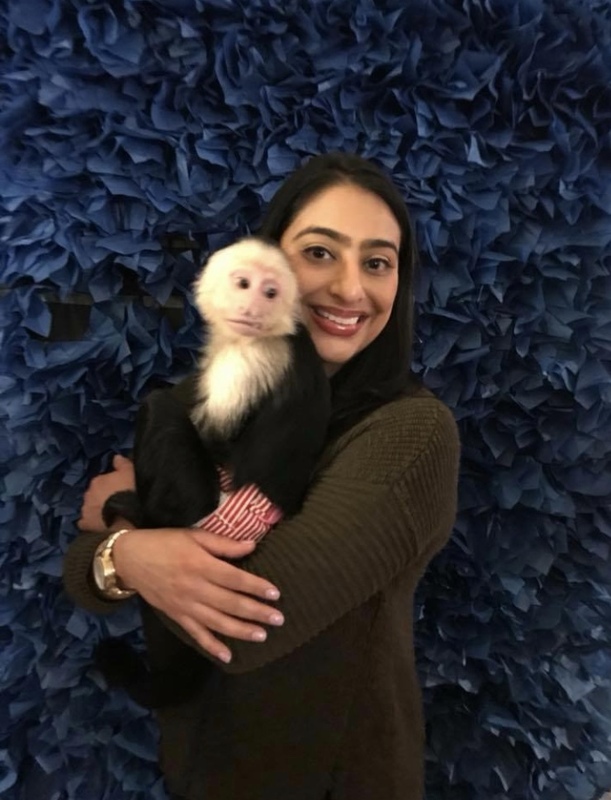 My quote to you clearly states we provide interaction with the monkeys and photos and that is exactly what we excellently provided for you! :"I introduce Sasha, Cody & Darwin and let them show off a few fun skills. Then the monkeys interact with the birthday child and their family as we take photos. 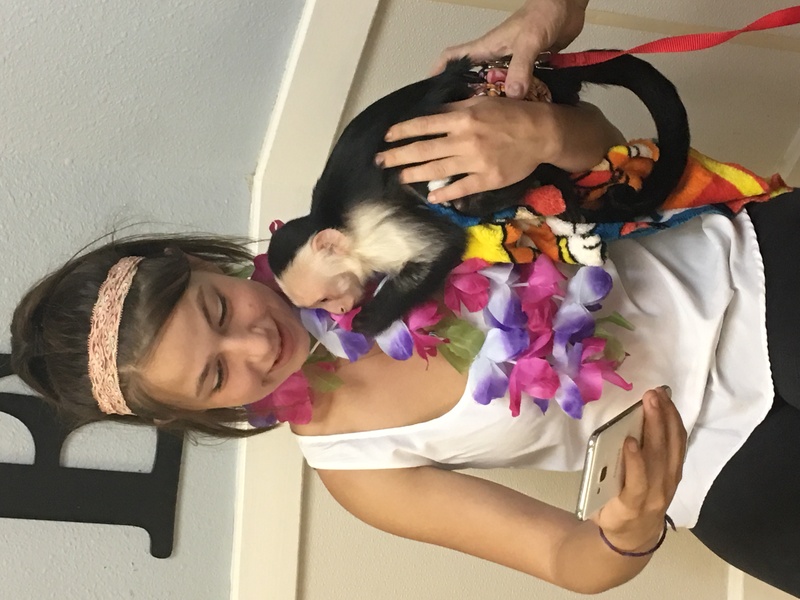 Then each of your guest gets a turn to sit and interact with the monkeys while take their photo. Before we leave we print out a set of 4x6 photos for you to keep and one for each of your guest. If you have any questions, please let me know." You received exactly what you were quoted and your son, the birthday boy and all of your guest were delighted! The boys were definitely amused. They were able to caress the monkeys and also took wonderful pictures. Kids need to be calm though. Overall, they had a great time. The experience was great! Not something you see often, so everyone was very intrigued! 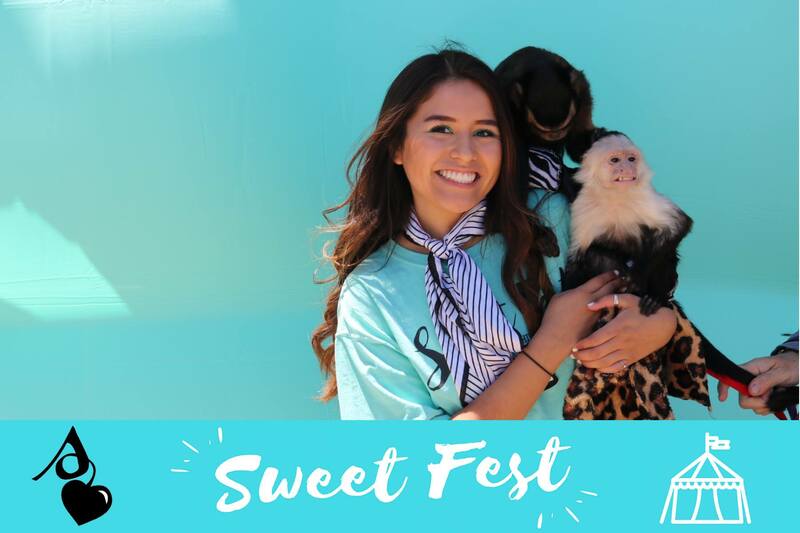 You can customize your own template when taking pictures with Darwin, Cody and Sasha (the monkey's). 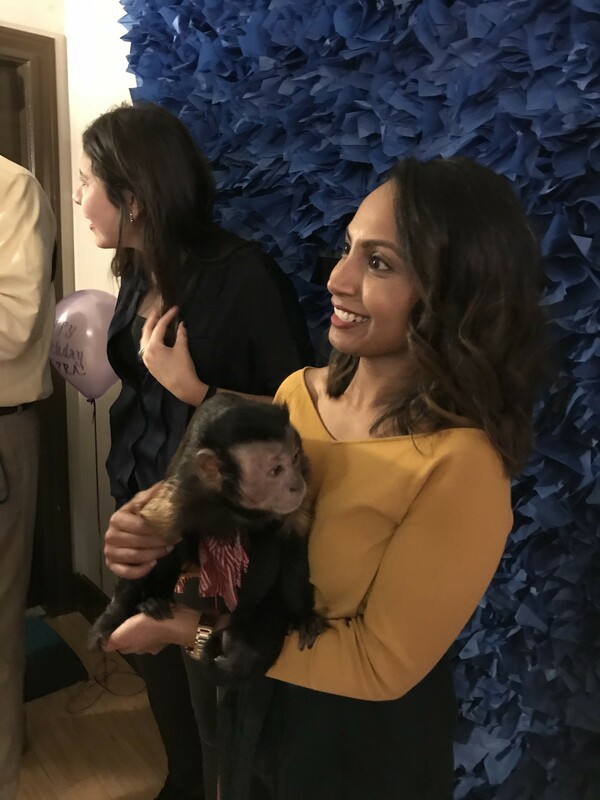 We had a great time at your event and appreciate you choosing Sasha, Cody & Darwin to monkey around at your holiday party! The monkeys were great!! 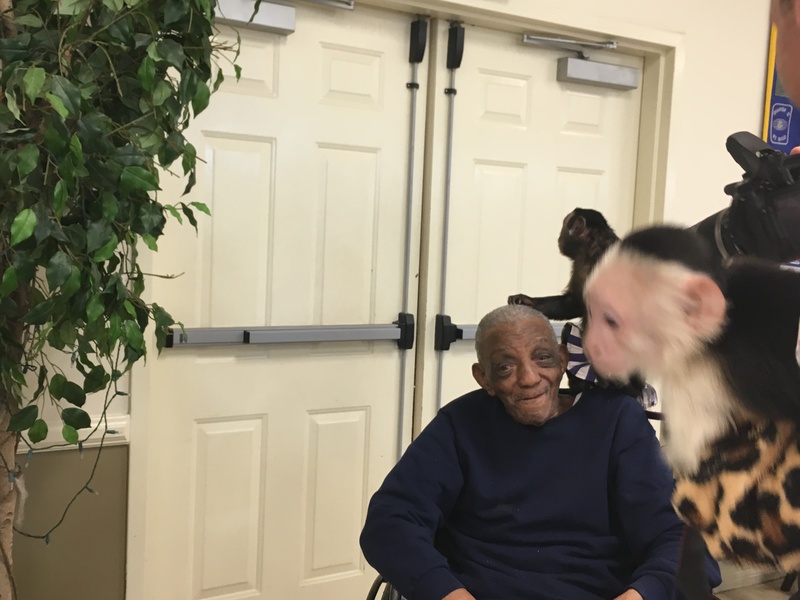 The gentleman that brought them out could have been a little more exciting and entertaining, Because of that I was going to give a 4, but the reality is it is more about the monkeys and not him, but that would have made it a more pleasant experience. 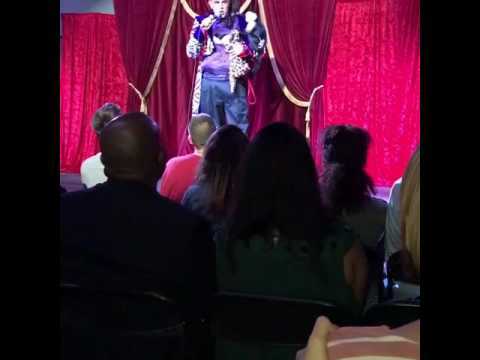 I strive to give the best as my 39 other reviews attest to, but its hard to smile when the host keep bringing their alcoholic drinks to close to the monkeys after being asked not too and then being drenched in one shattered drink and having more alcohol dripping down your back twice. I agree had I not had these problems it would have been a more pleasant experience with many more smiles. And being that this was a religious rite of passage party for 13 year old girls I was not expecting alcohol to be so important. Thanks! We couldn't have asked for a better entertainer. 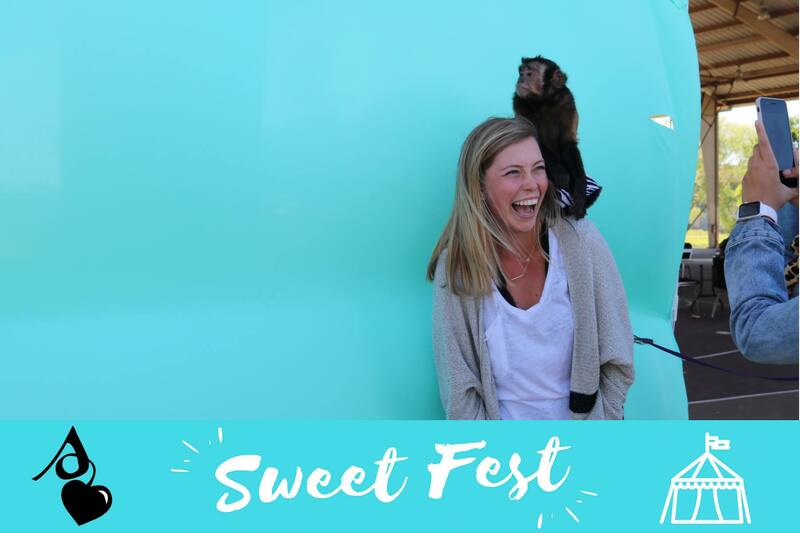 The 3 amazing monkeys where adorable, so well mannered and a big hit at our Festival. We will definitely be inviting them back. Awesome experience for the kids! Awesome time at Camp SJV! The kids and counselors loved it! Great experience for all. Fun and adds a lot to any party! 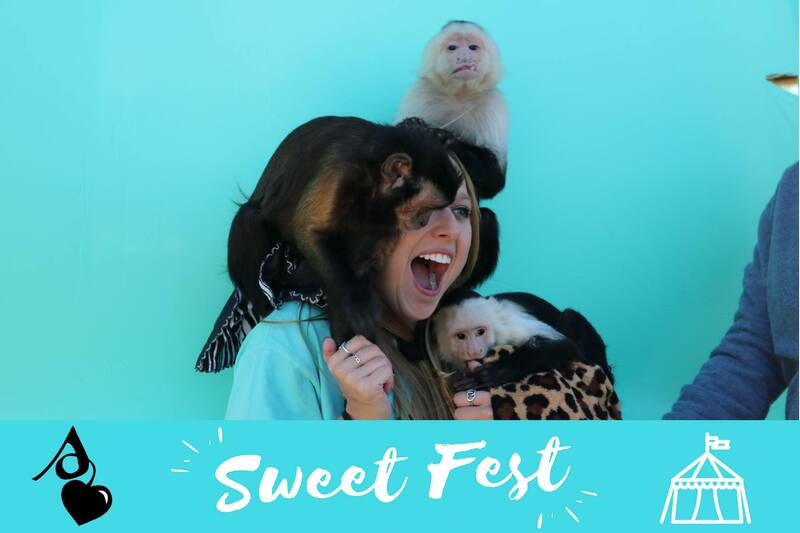 Monkeys are cute and sweet! Leslie, We loved your party and your are the hostess with the mostess and a swing! Robert did a fantastic job! 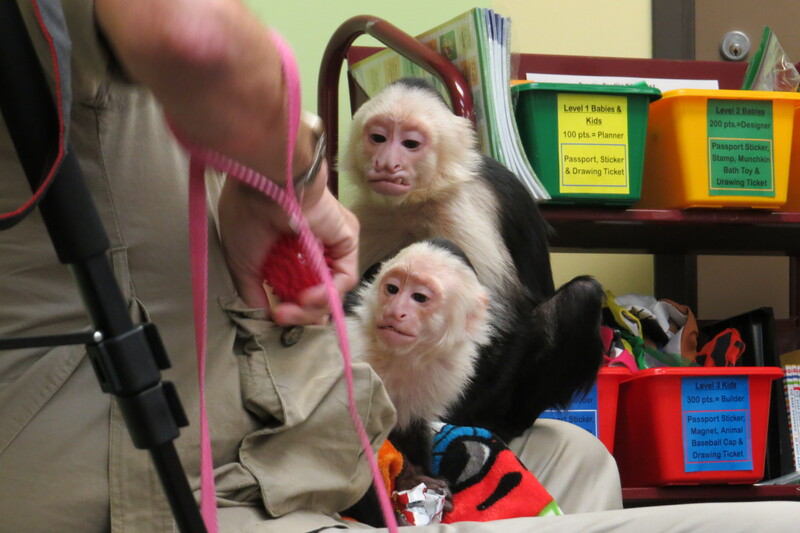 The kids were all amazed and thoroughly enjoyed learning about the monkeys. 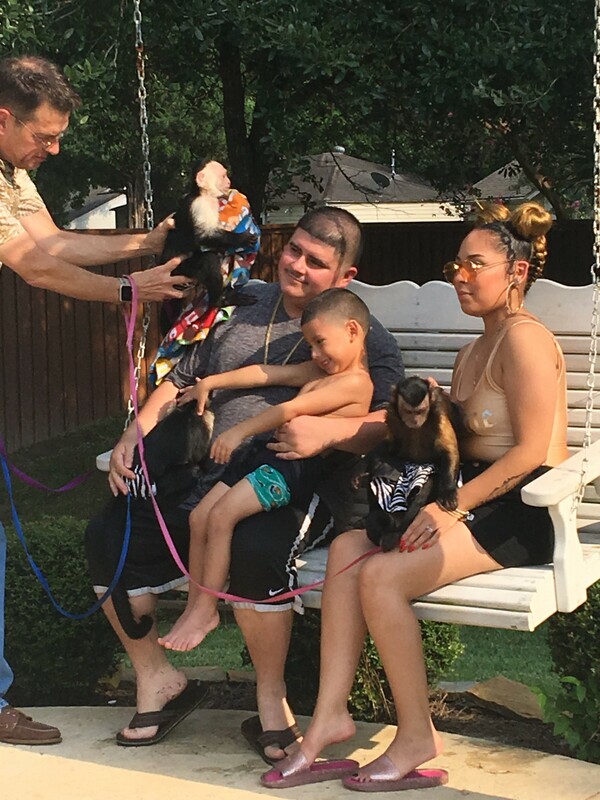 Robert has a great set up and let each child hold a monkey and have their picture taken in a very timely fashion. 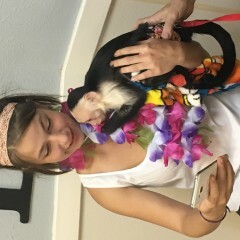 I have had Ms. Monkeys come to my school for summer camp and also to my nephews 1st birthday party and the kids and adults are always engaged and laughing! He was fantastic! His interactions with the children along with the monkeys was beyond exceptional. I'm not sure who enjoyed him more the birthday children or their parents. Definitely an experience we will never forget! and the disk of all of them is in the mail. Thanks again! Wonderful summer reading program - enjoyed by children, parents and staff! 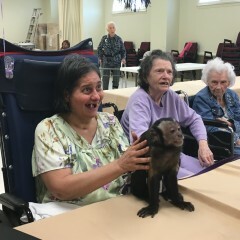 The monkeys were enjoyed by everyone! 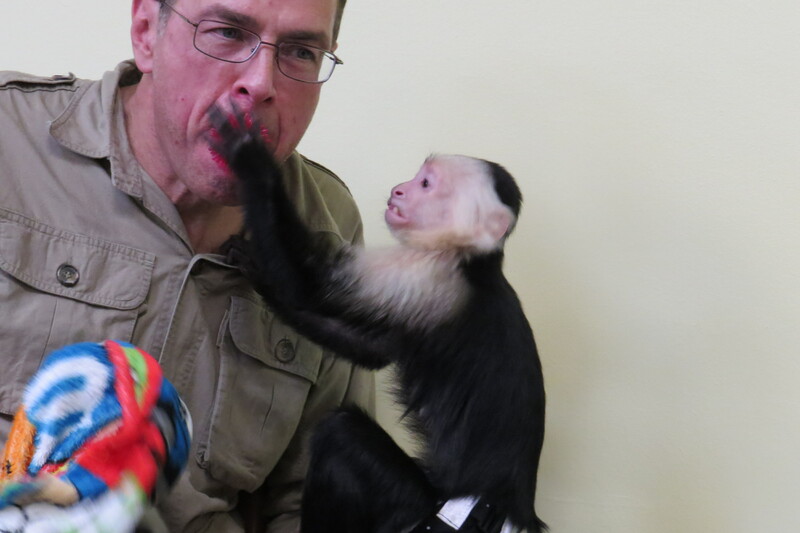 The trainer was very knowledgeable about the monkeys and answered everyone's questions. 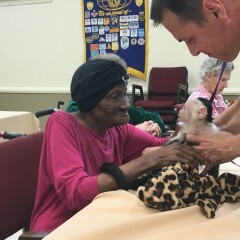 The children and adults got to hold/ pet the monkeys. 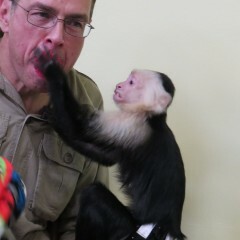 The monkeys were very tame and followed the trainer well. They took pictures and printed them out there which was very convenient. Thank you for the great entertainment! 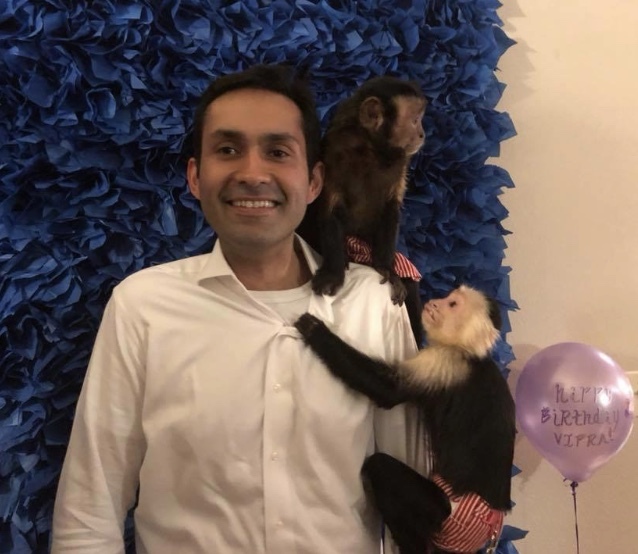 Thank you for including Sasha, Cody & Darwin in your party and for your delightful hospitality! 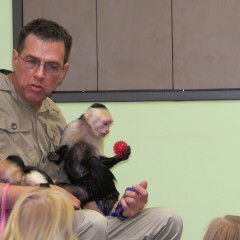 Robert was very prompt and kids of all ages, even 1 year olds and adults loved the monkeys!! I am booking them again for summer camp at my school! Well this was our second time to have the monkeys at our house and it even better then the first time! We will probably have third! They are so sweet and so much fun! Waller family, thanks for including us again! We had a great time with you and the disc of all the photos is already in the mail! We look forward to seeing you anytime! We loved the monkey's and Robert was very patient! 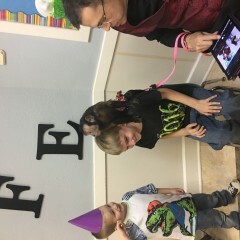 I have some health issues so planned a party at my sons dayscare. 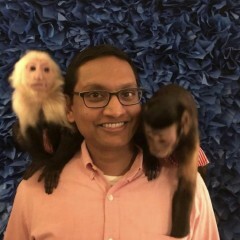 Had a few hickups since the school wouldn't let kids hold monkeys for pictures, but me. 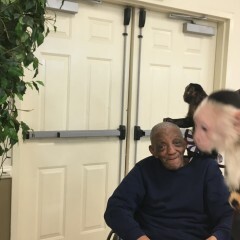 Monkey was able to work around it and give veryone a very special show - the kids got to sit next to him and take the pictures with the monkeys. Every child and even the teachers were very happy. 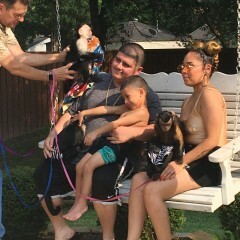 My son, his older brother, and sister who came to the party got to spend special time out side with the monkeys - holding and living on them. Truest was Ana amazing experience and will definitely be using him again for future parties. Highly recommend adding him to your schedule. Thank you Angela! The smiles of the birthday boy, your amazing so made it very special! We pray you have a speedy recovery and look forward to seeing you again. Thanks for including us in your sons birthday! Outstanding !! A party was a super hit cause of them. Thank you guys. Thanks for including us in your amazing party! Made our Chick-fil-A Carnival THE BEST! 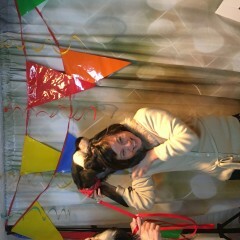 Monkeys were so fun, loved the pictures! A must have for your event! This was one of the greatest family events we have participated in. Thanks for the hospitality and we hope to work with your great group again! AMAZING!! 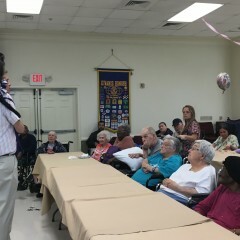 Wonderful interaction great with the elderly!! 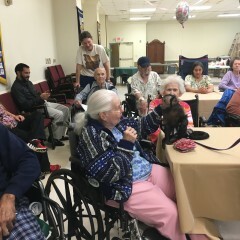 Our residents at my nursing facility absolutely loved them!!! They are so cute very energetic. 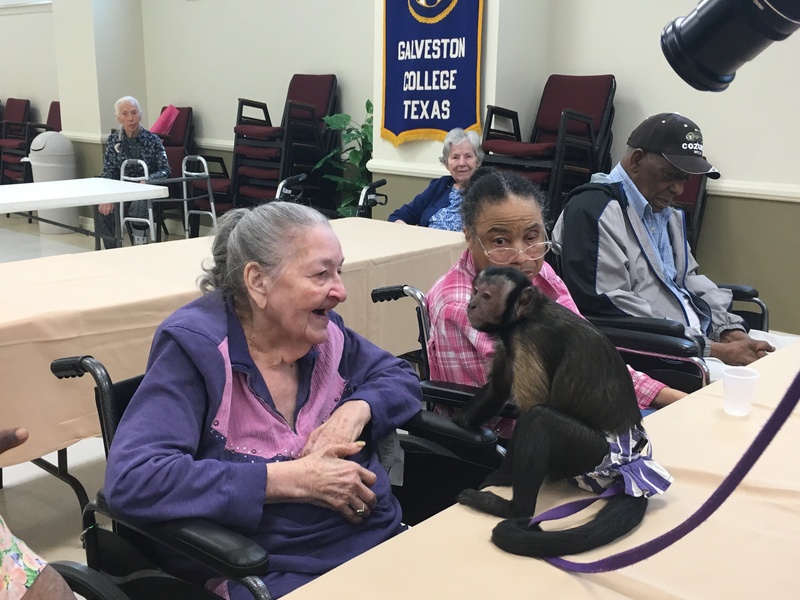 The residents loved receiving their pictures with Darwin and Sasha, they cant get enough of the "Monkey Business" !! :) Cant wait until we have the again!! We absolutely recommend this great group of performers fro any party or event!!! 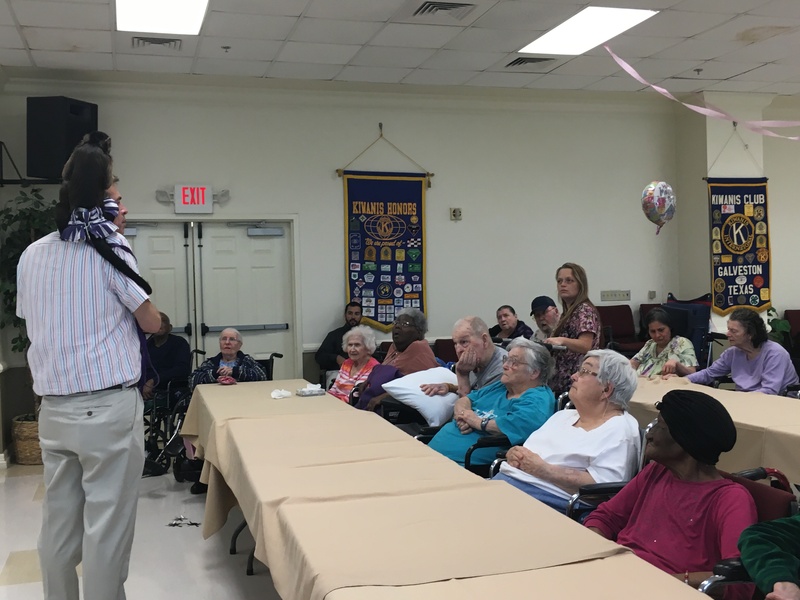 It was a real joy too entertain and interact with the residents of this fantastic facility! The joy on their faces was very rewarding! 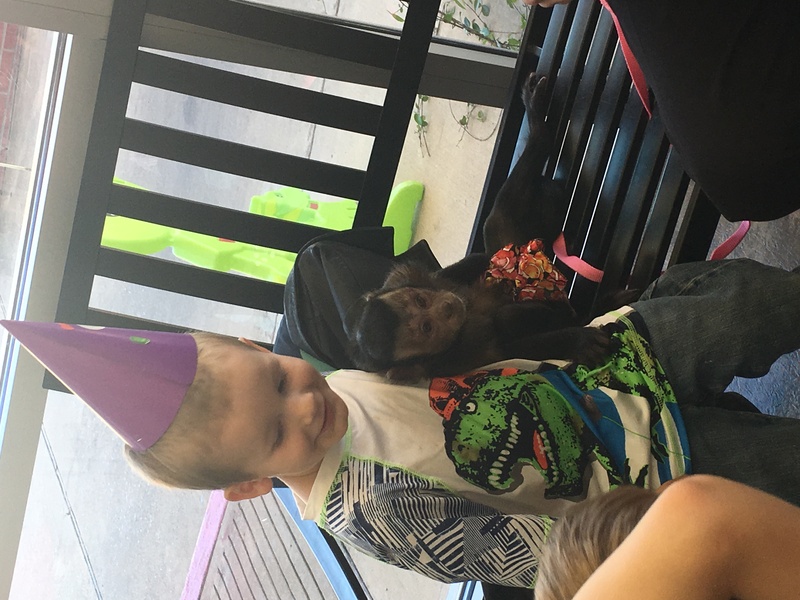 My 1 year old's party was extra special when these little guys showed up. Everyone had a blast with them. 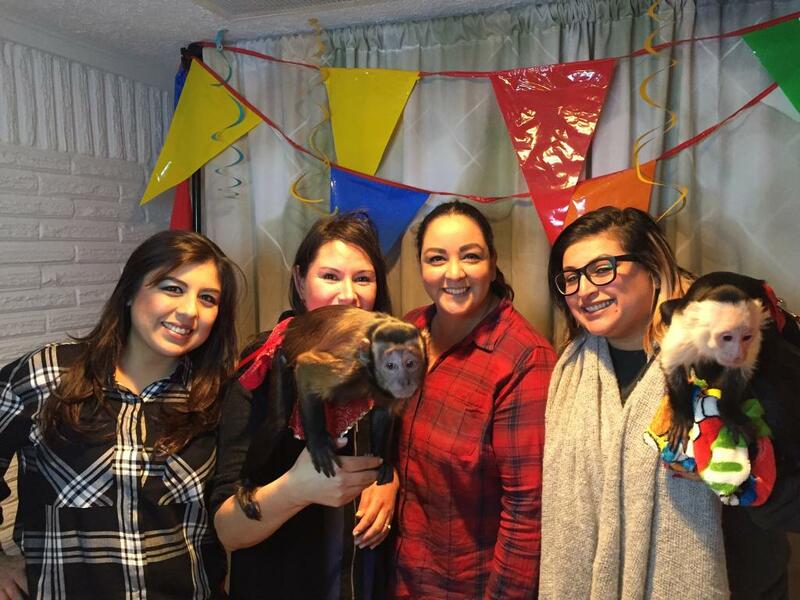 Thanks for including us in your childs 1st birthday party! I greatly appreciated your hospitality. Awesome time! 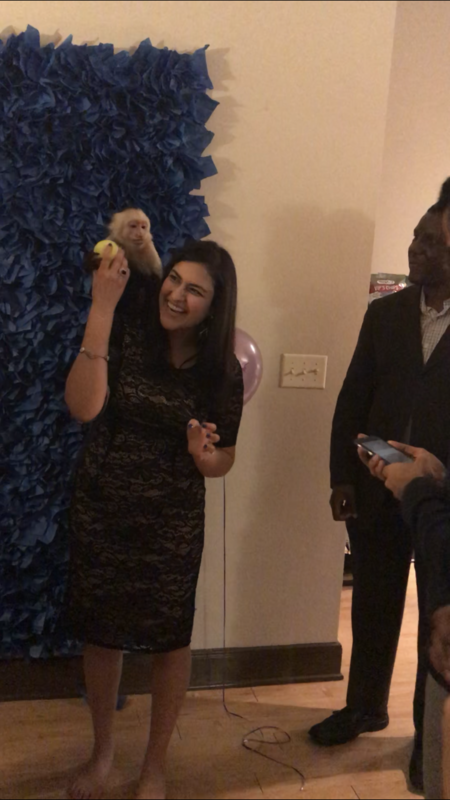 The monkeys were the life of the party! 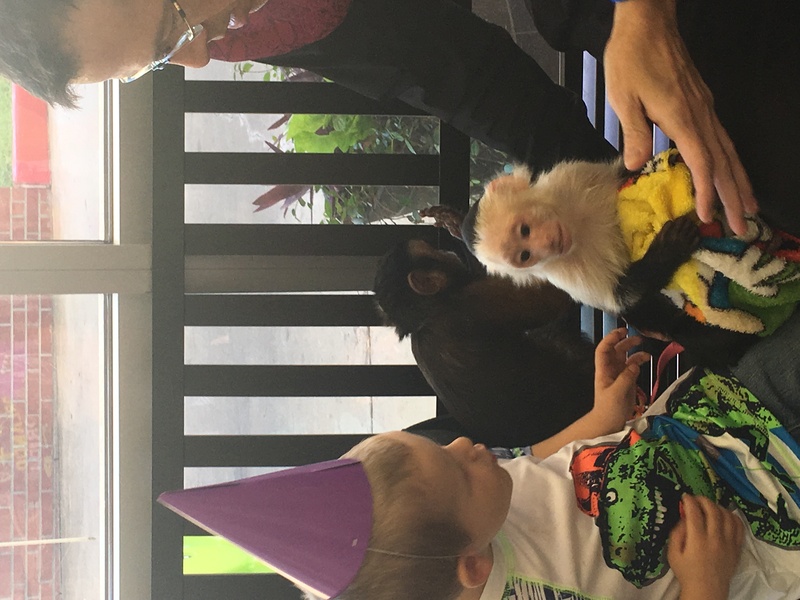 The monkeys made our son's 1st birthday party a huge hit. We had such a fantastic time. The monkeys are so general with all the kids and so much fun. Daughters birthday was a hit!!! 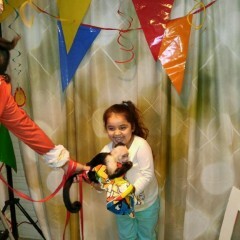 Ms. Monkeys worked with me to make my daughters birthday a hit!!! He traveled 3.5 hours and stayed long enough to make sure everyone got a photo. 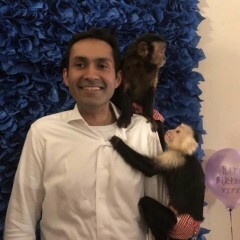 The monkeys are soooo adorable. 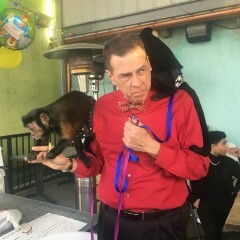 The monkeys took our daughters circus themed birthday party o er the top!!! Tha ks so much!!! Thanks for including us in this special event! Your hospitality and concern were much appreciated! Will be a necessity for future events!!! These guys were a smash hit at our party, and will be invited to all of our events in the future! Thanks Jaren, we enjoyed your hospitality! You were a great host! We had a blast with our new friends. All the kids loved them and were so excited. So were the adults! Can't wait til next years party to use them again! Thanks again! Thanks very much for including Sasha, Cody, Darwin and I in your wonderful party! This was an awesome show. If you need entertainment this is a great act. Amazing! 5 stars all the way! 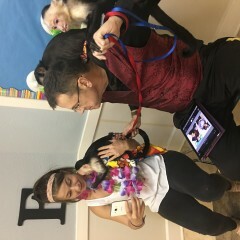 Mr. Robert and his team were great at our two events and the monkeys were amazing! All the kids had a great time and got to walk away with a photo that really made the experience memorable. Will be booking them again! We had a wonderful time working with Colleen! 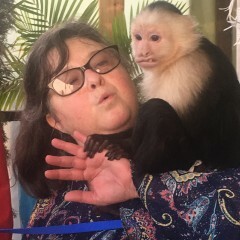 She was a fantastic host, very attentive and concerned with the Monkeys and their needs! She and her team are true professionals which make an event even better! Thanks! 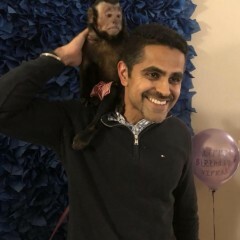 We booked Ms. Monkeys for my daughter's third birthday party. It was awesome! The photographer was great. 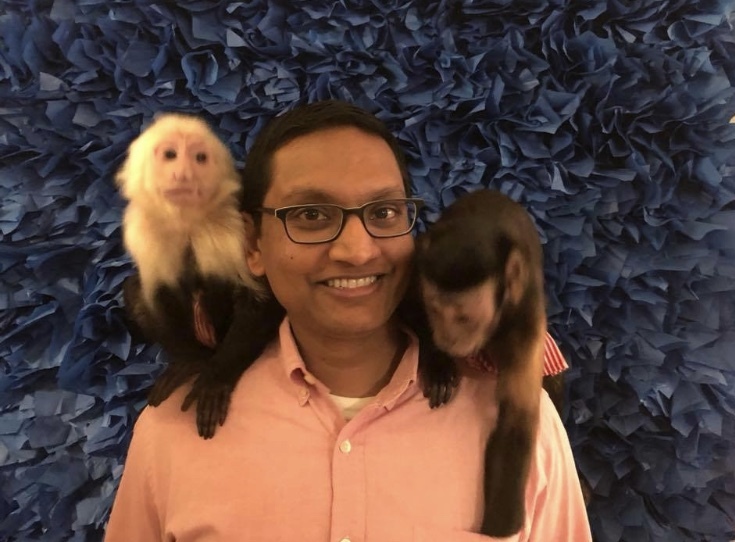 He took so many great shots of the monkeys interacting with my guests! I was able to hand out the photos right then, which was a huge time saver for me! 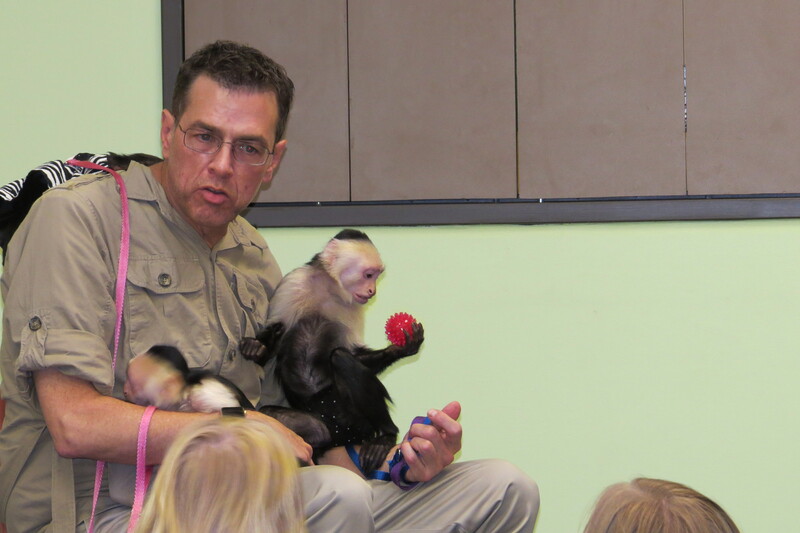 They were very knowledable and you could really see the great bond he has with the monkeys! I would definitely recommend booking so you don't miss out! Thanks for including us in your daughter's birthday celebration! We had a great time and greatly appreaciate your hospitality! So much fun for everybody! Kids and adults !!! Paula, thanks for being such a fun host and including Sasha, Cody, Darwin and I in your party! 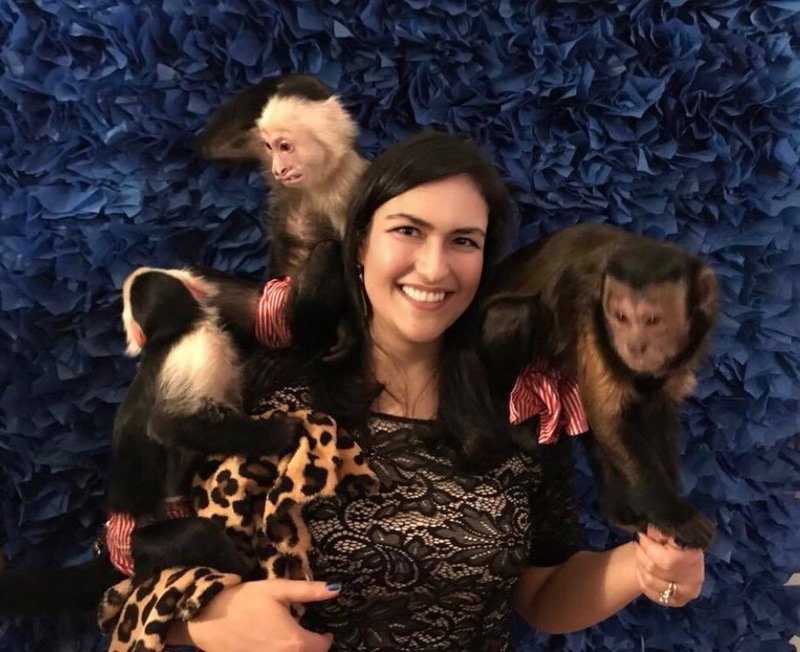 We used Ms. Monkey's as the entertainment at our African Safari themed wedding and our guests just LOVED THEM! 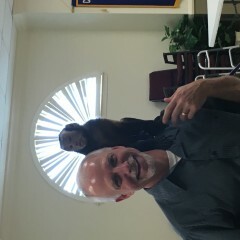 Robert is great to work with and the monkeys are so much fun. You can really tell that he has worked with them a lot and the baby Darwin is just so precious. I would give them more than 5 stars if I could! Thank you for making our wedding one for the books! Everything was perfect! 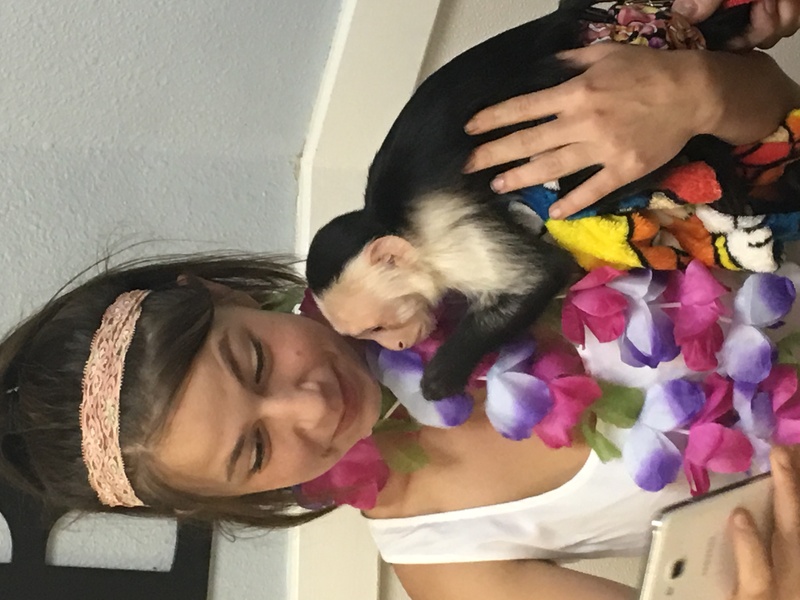 We enjoyed every moment, and the 7 girls will never forget their experience with the monkeys! I am certain we will do this again! Thanks for booking us and more importantly thanks for your great hospitality and allowing us to help celebrate your daughters birthday with you! 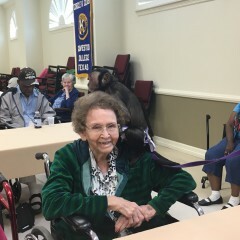 Thanks Joan for including us in your wonderful event and for taking time to let others know of your experience with us! We welcome the opportunity to work with you anytime! He was great! 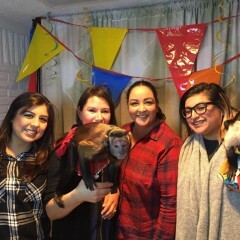 My guests and I, especially my little birthday monkey loved him and HIS monkeys. Very very entertaining! More than worth it. Thanks again Robert! Thank you Hilary! Your party was great and your hospitality most appreciated! The terrific food you sent did not make it home. Sasha, Cody and Darwin also loved your potato salad! 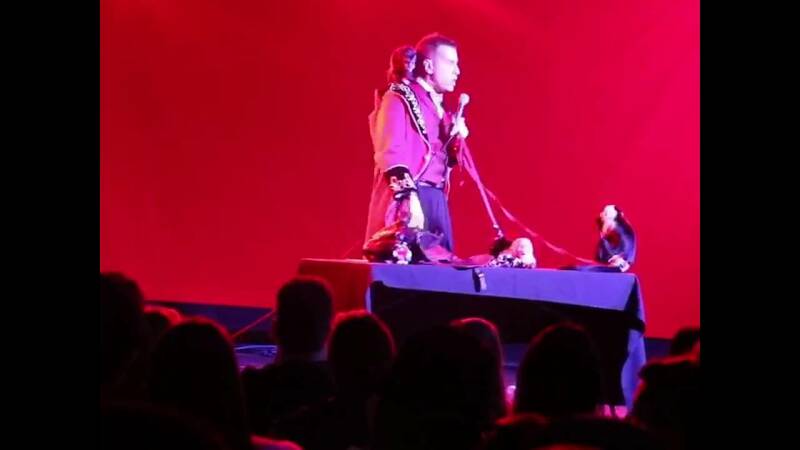 Robert and his monkeys (Sasha, Cody and Darwin) were absolutely fantastic! 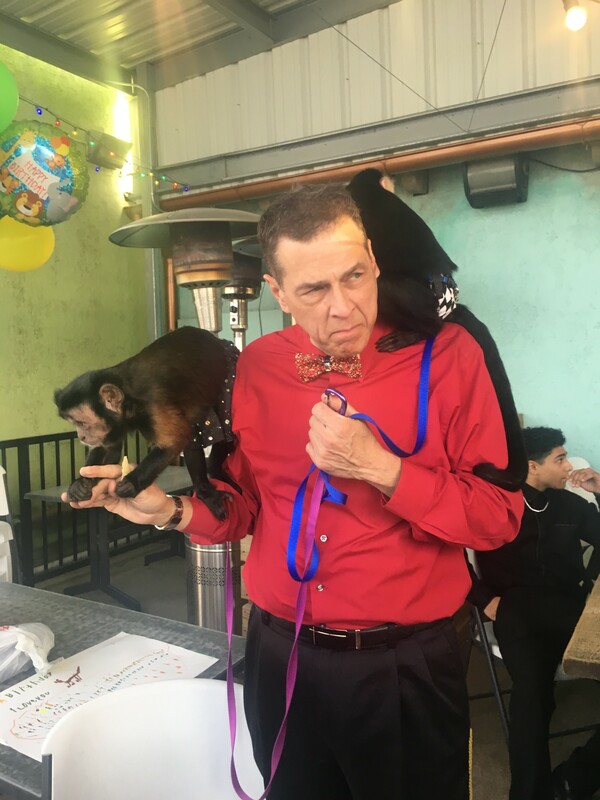 The monkeys were so interactive, and Robert was happy to let everyone at our party play and take pictures with them. 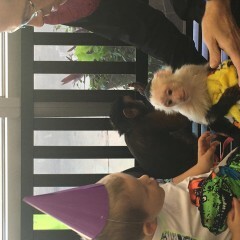 Sasha, Cody and Darwin were the biggest hit! I highly recommend booking Robert! Jason, Thanks for inclduing us in your first class event! We had a great time and would work with you again anytime! This was an amazing bday event for my 11 yr old daughter. She & her guest had so much fun interacting with the monkeys & taking lots of pics with them. Not only did the kids enjoy this event, but also the adults loved it. These guys were AWESOME! Thank you for a great time! Pearl, You were a terrific hostess and we appreciate the kindness you extended having us at your daughter's party! 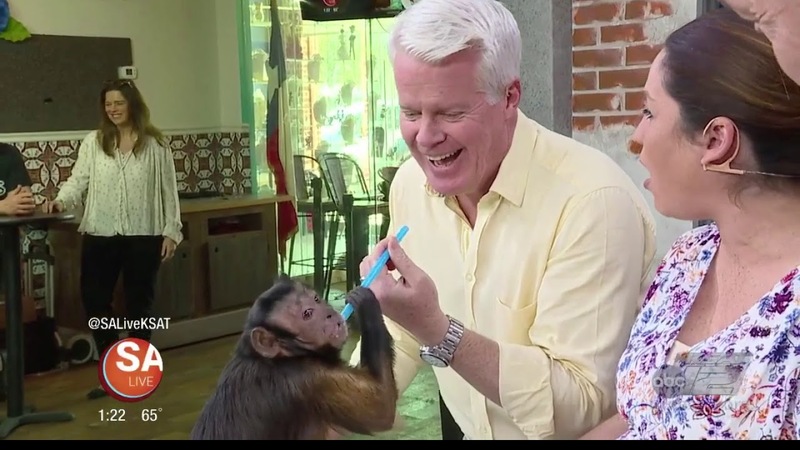 Robert and his team, including the monkeys, were great. They were professional, accommodating, and very easy to work with. But the monkeys made ordinary photography into a hit. 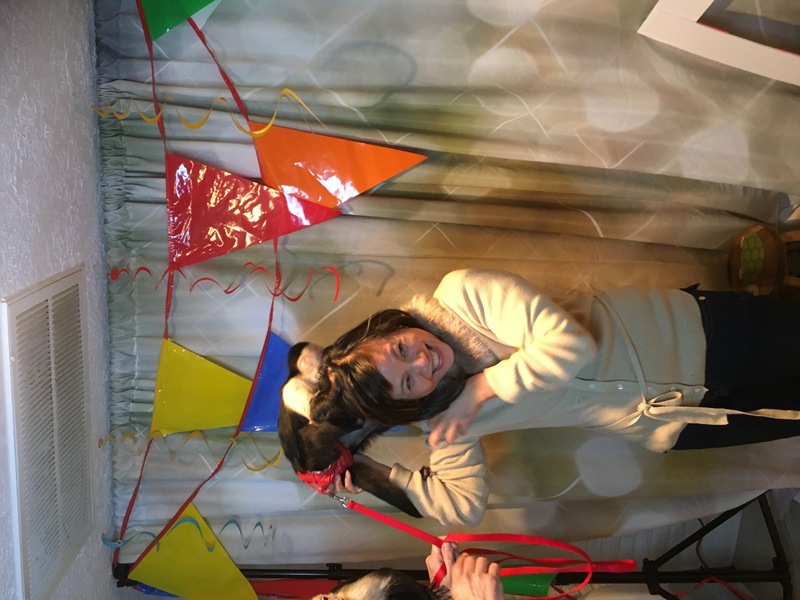 The animals were wonderful and we are certainly glad we booked them for the event. Thanks for a great time. Insurance: $100,000 - Full specialized exotic animal property and individual liability coverage. 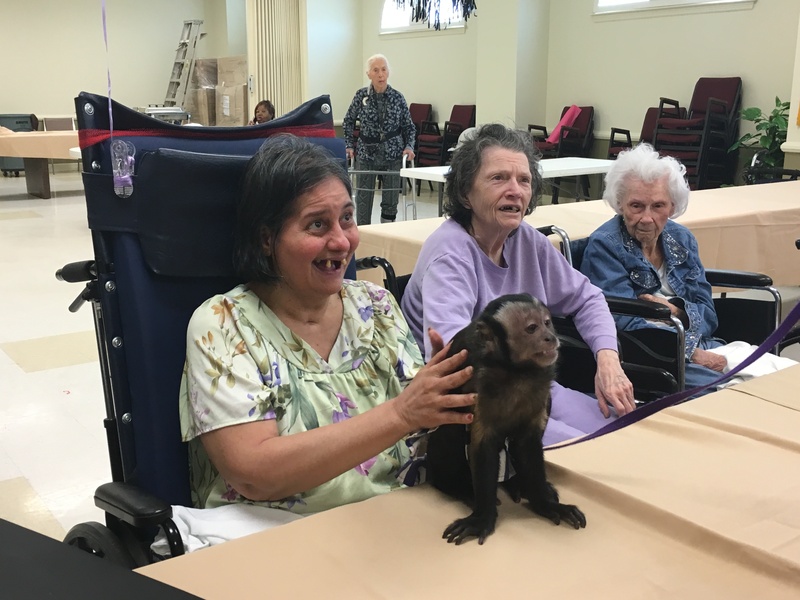 When you schedule us for your party or event, you get two well trained Capuchin monkeys who know how to interact with the public and who love to pose for pictures with all of your guest. 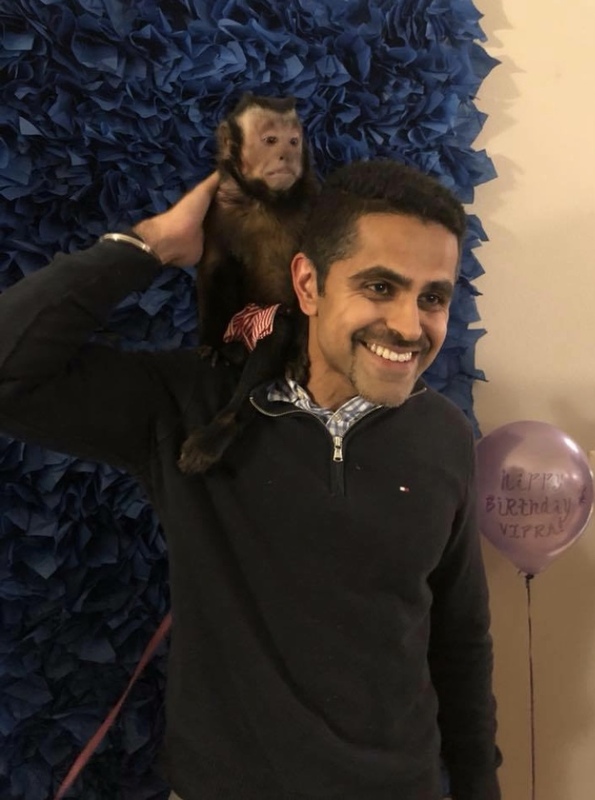 Our trained team captures the best photo of each guest with the monkeys and prints them out so that your guest leave with a lasting memory of your great party! We can also add your logo or information to the photo, making it a walking advertisement. 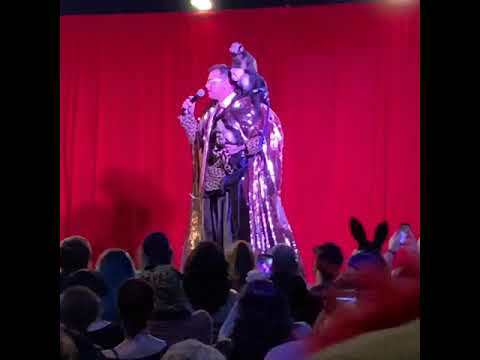 Sasha and Cody made their public debut when they were just a few months old and have been delighting audiences both young and old continually. They were born in a private zoo in the Smokey Mountains of Tennessee to mothers that were unable to raise them. Being social by nature, they love interacting with everyone they come into contact with as you can see from the many photos we have shared here on GigSalad.